For years, there has been an unmet need for a clear professional development pathway beyond the entry-level Certified ScrumMaster® (CSM®) course. Now it is available as the “Path to CSP” from the world’s premier Agile professional development body: Scrum Alliance. Equinox IT is proud to be the first organisation to offer this in New Zealand. NOTE: course registrations close four days before the course start date as there is a non-trivial amount of pre-work expected for this course. Our Advanced Certified ScrumMasterTM (A-CSMTM) course is a practice-based learning experience focused on skills acquisition to help you take your Agile leadership to the next level. It builds on your learning and experience since you completed your Certified ScrumMaster (CSM) course. It is also a critical next step for ScrumMasters who are looking to attain the high bar of Certified Scrum Professional – ScrumMaster® (CSP-SM®). Find out more about the ScrumMaster 'path to CSP'. A-CSM says to your employer and the job market that you have proven that you can work in a ScrumMaster capacity with teams. From your CSM you already know about the values, principles and practices of Scrum. Now it is time to extend your capability to overcome the challenges that you have been facing in implementing Scrum at work. Having practised Scrum or a Scrum-like Agile approach for 12 months or more, you know that the ScrumMaster role is a very challenging role to perform in an impactful way. It involves much more than being just a "team facilitator". It requires development of a variety of skills from professional coaching to systems thinking to change and growth leadership whilst serving the Product Owner and broader organisation in addition to one or more development teams. It requires deep understanding of Scrum, Agile and Lean principles as well as the confidence to challenge both yourself and your colleagues to change their thinking and unwind their ingrained habits. Our A-CSM programme involves a two-day in-person course plus several hours' worth of preparation work prior to the course. It builds on the foundations from CSM, providing the next stage of growth for ScrumMasters who want to help Scrum be adopted more successfully in their organisations. A-CSM is an invitation to bring your real-world context in for exploration and problem solving with a diverse group of experienced ScrumMasters. As well as coming away with a set of thinking and problem solving tools, you may even come away with fresh perspectives and new options for the challenges that you face at work right now. The course is delivered by Rowan Bunning, a Scrum Alliance Certified Scrum Trainer, who has been delivering CSM and Certified Scrum Product Owner (CSPO) training in New Zealand with Equinox IT since 2009, with outstanding results and delighted participants. Rowan became a ScrumMaster in 2003 whilst in Australia, subsequently working in this capacity with a leading Scrum-based digital consultancy in the United Kingdom and the Republic of Ireland. He bacame the first CSP in Australia in 2006 and the country's first Path to CSP Educator in 2018. Rowan has designed this A-CSM course from the ground up to be experience-based with rich learning resources for you to discuss and enact. This minimises time spent listening to lectures and allows you to learn through multiple modes including hands-on practice. It also provides many opportunities to learn from the experiences of the accomplished ScrumMasters in the room. Rowan puts the techniques into context with real-world examples from his Scrum experience over the last 15+ years. Also see our 'Advanced Certified ScrumMaster questions and answers' page. progress on the path to becoming one of a relatively small number of Certified Scrum Professionals in the country. Team Dynamics – understand the attributes of effective teams, establish a rich team development model, apply techniques for improving team performance, and avoid team development pitfalls. Coaching – understand how professional coaching differs from advising, and practice coaching techniques that you can use every day. Resolving Impediments – practice systems thinking techniques to reveal the dynamics causing impediments and intervene to truly eliminate them. Complimentary frameworks – know when to leverage XP, Kanban and Lean Start-up techniques in ways that compliment Scrum. Engineering Practices – understand the various technical practices and how they improve the team's ability to sustainably deliver potentially releasable increments and enable scaling. This course is for ScrumMasters, Agile Coaches, Development Managers and Delivery Managers, who understand the basics of Scrum, have over one year of ScrumMaster work experience, and hold a current Certified ScrumMaster (CSM) certification. To achieve the certification, you must meet the prerequisites (as stated below), you must attend the full two-day course, and complete all coursework, including all in-class coursework and any pre, during and post coursework that we provide. You will then be eligible to receive your certification. There is no test or exam component as part of this certification. Hold an 'active' Certified ScrumMaster (CSM) accreditation. Note, that if it has been more than two-years since you completed CSM, and you have not renewed your Scrum Alliance membership, your CSM will be inactive and you will be ineligible for A-CSM. To activate it again please go to the Scrum Alliance renewing certification page, click RENEW NOW. You will be required to pay US$100 to the Scrum Alliance to re-activate your certification for two years. Have at least one year of work experience in the role of ScrumMaster. 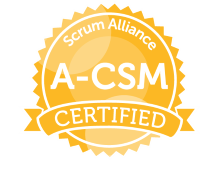 Note, you can attend the A-CSM course prior to achieving the required ScrumMaster experience, but the Scrum Alliance will not award the certification until you have provided evidence of 12+ months of ScrumMaster experience in your Scrum Alliance profile. Our recommendation is to gain the experience prior to sitting the course to avoid delay in obtaining the certification after the completion of the course. Actively participate in the full two-day course and complete all coursework (including all pre-work and all in-class and other out of class coursework) to the satisfaction of the trainer. Note, there is no test or exam component as part to this certification. For more information also see our 'Advanced Certified ScrumMaster questions and answers' page.